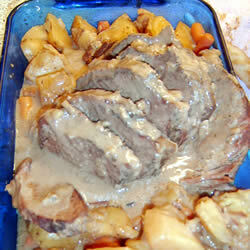 I know there are many ways to cook a pot roast but I think this is very easy and tastes good. Heat some olive oil or Canola oil in a pan and when it is hot, set the roast in the pan and sear it on all sides. Don’t burn it, just brown it so there is no red meat. As you turn it to brown it, try not to poke a hole in the roast or you let out the juices. When you sear it, it will hold the juices inside. When all the sides are browned, place it in your crockpot. I like to pepper the roast and sometimes I like to add sliced onion over it. I used to add carrots and potatoes to the crockpot but I think the gravy tastes better when you do NOT add carrots to the mix. I cook and mash potatoes separately, too. In a bowl, stir together the cream of mushroom soup with the dry onion soup mix and pour it over the pot roast. Add a little bit of water if too thick for your taste. Cover it and cook on low for about 8-10 hours or until tender. I didn’t realize it was so simple. Once we have money to buy stuff I’m making this for Sunday din din.